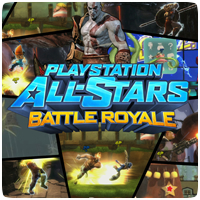 Two more character strategy videos have been released for PlayStation All-Stars Battle Royale, this time you can learn about that cake loving Fat Princess and master thief Sly Cooper. You can also see strategy videos for the other characters, including Sweet Tooth, PaRappa the Rapper, Kratos and Radec. Fat Princess, much like Sweet Tooth, is a character that never found herself participating directly in battle. She has graceful ballerina pirouette attacks in which she actually just throws her weight around, plowing through anyone that gets in the way. She also has a level 1 super called “Feed Me Cake”. Sly Cooper’s charisma and personality are so strong that his play style pretty much creates itself. In terms of play style, Sly operates much differently than the rest of the cast. He loses the ability to block or roll in exchange for invisibility. Holding down L1 grants him stealth, allowing him to sneak around the battlefield undetected. As a Master Thief, Sly also has the exclusive ability to steal opponents’ AP with his Neutral Square cane swipes.